pretty sure I quit shopping with both RAZER & RAT due to the QA issues, and overall massive drop in build quality, sensor aside. N that was back in 2010. Before that though, RAT was an amazing mouse, used by many many many many people. We just didn't really track that stuff back then because the esports nonsense hadn't really come of age yet. Glad OP found what he was looking for. I love the G900, though I haven't done the true test yet (shooting at real people.) which is where my hand always cramps. for the office - returned Logitech Vert mouse for a cheep $20 one that takes batteries, doesn't use USB-C, & doesn't have 3 forms of connectivity built in. i don't think having the pressure on the wrist or ball really makes a whole lotta difference, however it may be enough of a difference to stave off wrist pain since I use vert in the office & standard @ home. 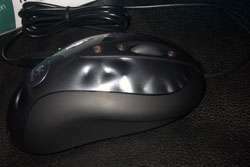 Hey, today i received my logitech MX518. And i'm mostly dissapointed to be honest, didn't knew this mouse was a 1-3-1 shape. Plus it have some borders at the top of the mouse buttons, making it not that large enough, my fingers surpass it [IMG class=inlineimg]/forum/images/smilies/frown.gif[/IMG]. What i like is the very low LOD, the materials and the thumb support. Last edited by LinCeX; 03-12-2019 at 01:24 PM. The most "neutral" big mouse for palm grip I've used is the Fnatic Clutch 2. And i'm mostly dissapointed to be honest, didn't knew this mouse was a 1-3-1 shape. Plus it have some borders at the top of the mouse buttons, making it not that large enough, my fingers surpass it . What i like is the very low LOD, the materials and the left thumb support. no shape is forcing 1-3-1 or 1-2-2. you have a very strange perception that mouse is supposed to enforce ergonomics on you. it is not. MX518 does kind of force 1-3-1 with the ledge on the right side. Is hard to explain, my native language isn't english. But the right side of the mouse, isn't straight. It haves a pinky support. So putting your ringer in that side will hit the edge and that will be painful and discomfort after some time. It is definitely a mouse design to have 3 fingers on top. Yea that ledge was the reason i gave my g400 to a friend. The ledge is perfectly placed where my ringfinger sits, which made it unusable for me.